Note: The following procedure assumes you are creating a page on a team site. Commands and instructions can vary on other sites. Note: If you don't have a list, you'll need to create one. To do that, see Create a list in SharePoint. 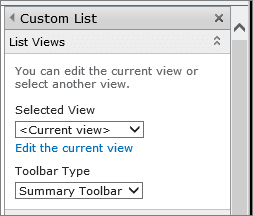 Whenever you select or edit a list view, a copy of the list design is made from the original site list design and saved with the List View Web Part. However, the list data remains the same. Be careful when you switch to a different view from the current view. You may delete changes that you made to the current view and may disable Web Part connections that depend on columns in the current view. You are prompted for confirmation if you switch views. At the bottom of the tool pane, click OK. Note: If you don't see Connections on the menu, click Edit Web Part to open properties, and then click the down arrow again. You can open properties on either the filter or the list web parts. Note: In the browser, you may need to enable pop-ups from this site to view the Configure Connection dialog box. Note: The Text Filter Web Part does not recognize wildcard characters. If a user enters a wildcard character, such as an asterisk (*) or a percent sign (%), the character is interpreted as a literal character. Note: The following procedure assumes you created a page on a team site. Commands and instructions can vary on other sites. Note: Whenever you select or edit a list view, a copy of the list design is made from the original site list design and saved with the List View Web Part. However, the list data remains the same. Select Offset from today, enter the number of days in the Days text box (the maximum value is 999), and then select either After Today or Before Today. This default value is then used to display the initial list of values in the List View Web Part when the page first displays. To connect the Date Filter Web Part, point to the Date Filter Web Part, click the down arrow, click Connections, click Send Filter Values To, and then click the name of the List View Web Part to which you want to connect. In the Choose Connection dialog box, select the Content Type, click Configure, set Consumer Field Name to the column that you want to filter the List View Web Part by, and then click Finish. To dynamically change the results that appear in the List View Web Part, enter a date or click the Date picker button, and then press ENTER. The value that you enter must exactly match a value in the column that you specified in step 15. To redisplay all the values in the List View Web Part, you must clear the date from the text box, and then press ENTER. Note: A user needs to enter the date in the short date format for the current regional setting used by the SharePoint site. The short date format can vary depending on your computer or site's regional setting. For example, for English (United States) use mm/dd/yyyy, and for French (France) use dd/mm/yyyy. The user can also use the date picker to ensure the correct date entry. Tip: You can also use the name as a label or a brief instruction to the user. For example, you can use Filter Reports By: as a label to tell users they can filter the view of a Reports list. Note: The list of choices must contain at least one choice and must be unique. Neither the value nor the description may exceed 255 characters in length. The maximum number of choices is 1000. To enable the clearing of a filter so that users can see all the values in the List View Web Part, select Allow Multiple selections. In this case, the Select Filter Value(s) dialog box displays check boxes, rather than radio buttons. Note: You cannot use this feature to display the filtered results of two or more selections, because The List View Web Part does not support multiple selections. If a user chooses multiple selections, only the first selection is used. To connect the Choice Filter Web Part, point to the Choice Filter Web Part, click the down arrow, click Connections, click Send Filter Values To, and then click the name of the List View Web Part to which you want to connect. In the Choose Connection dialog box, select the Content Type, click Configure, set Consumer Field Name to the column that you want to filter the List View Web Part by, and then click Finish. When you are done configuring the connection, in the Pagetab, click Save & Close to save and view the page. To dynamically change the results in the List View Web Part, in the Choice Filter Web Part, click Filter, click a value, and then click OK. If you selected the Allow Multiple selections property, to redisplay all the values in the List View Web Part, you must clear all the check boxes in the Select Filter Value(s) dialog box, and then click OK. Note: If the Edit command is disabled, you may not have the permissions to edit the page. Contact your administrator..
Click the page where you want to insert a Current User Filter Web Part and a List View Web Part. Important: When you make the connection between the SharePoint List Filter Web Part and the List View Web Part, make sure you choose a column that has matching values to the Value field property. Note: A SharePoint List Filter Web Part has a limit of 100 items. Note: The Select Filter Value(s) dialog box displays check boxes, rather than radio buttons. In the Configure Connection dialog box, select the Connection Type, click Configure, set Consumer Field Name to the column that you want to filter the List View Web Part by, and then click Finish. Note: The following procedure assumes you are creating a Web Part Page on a team site. Commands and instructions can vary on other sites. Note: If you don't see Connections on the menu, click Modify Shared Web Part to open properties, and then click the down arrow again. You can open properties on either the filter or the list web parts. Note: A user needs to enter the date in the short date format for the current regional setting used by the SharePoint site. The short date format can vary depending on your computer or server site's regional setting. For example, for English (United States) use mm/dd/yyyy, and for French (France) use dd/mm/yyyy. The user can also use the date picker to ensure the correct date entry. Note: The list of choices must contain at least one choice and must be unique. Neither value nor description may exceed 255 characters in length. The maximum number of choices is 1000. In the Control width in pixels text box, enter a number indicating the width of the choice text box as the number of pixels, or an empty value or "0" to automatically size the text box. Because the value entered by the user appears in this text box, you probably want to make it wide enough for the largest possible value. To enter an initial value in the Choice Filter Web Part text box, enter a default value in the Default Value box, a value that typically matches one of the values entered in step 2 of step 5. This default value is then used to display the initial list of values in the List View Web Part when the Web Part Page first appears. 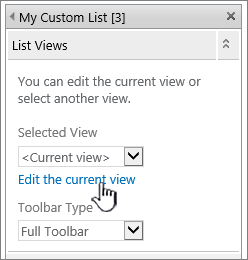 If you selected the Allow Multiple selections property, to redisplay all the values in the List View Web Part, the user must clear all the check boxes in the Select Filter Value(s) dialog box, and then click OK.
Add the Current User Filter Web Part and the List View Web Part to the Web Part Page. In the Current User Filter Web Part, click the Open the tool pane link. The Current User Filter Web Part enters Edit Mode, and the Web Part tool pane appears. To pass only one value by using the Web Part connection, select Send only the first value. To pass two or more values by using the Web Part connection, select Send all values. To pass two or more delimited values by using the Web Part connection, select Combine them into a single value and delimit with, and then enter one or more characters in the text box. Click the Web Part menu for the Current User Filter Web Part, point to Connections, point to Send Filter Values To, and then click the name of the List View Web Part to which you want to link. To dynamically change the results in the List View Web Part, display the Web Part Page. Because the Current User Filter Web Part is a context Web Part, the results display automatically without user input. Add the SharePoint List Filter Web Part and the List View Web Part to the Web Part Page. In the SharePoint List Filter Web Part, click the Open the tool pane link. 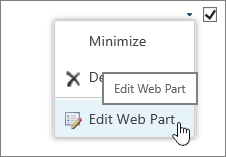 The SharePoint List Filter Web Part enters Edit Mode, and the Web Part tool pane appears. Important: When you make the connection between the SharePoint List Filter Web Part and the List View Web Part in step 10, make sure you choose a column that has matching values to the Value field property. In the Control width in pixels text box, enter a number indicating the width of the text box as the number of pixels, or an empty value or "0" to automatically size the SharePoint List Filter Web Part text box. Because the value entered by the user displays in this text box, you probably want to make it wide enough for the largest possible value. To enter an initial value in the text box, enter a default value in the Default Value box, a value that typically matches one of the values in the column specified in step 4 of step 5. This default value is then used to display the initial list of values in the List View Web Part when the Web Part Page first appears. To enable users to filter by a null value, select "(Empty)" value. For example, users may want to see all values in a column that have no entry. To enable the clearing of a filter so that users can see all the values in the List View Web Part, select Allow Multiple selections. The Select Filter Value(s) dialog box displays check boxes, rather than radio buttons. Note: A user cannot use this feature to display the filtered results of two or more selections, because The List View Web Part does not support multiple selections. If a user chooses multiple selections, only the first selection is used. Click the Web Part menu for the SharePoint List Filter Web Part, point to Connections, point to Send Filter Values To, and then click the name of the List View Web Part to which you want to link. In the Configure Connection dialog box, select the column that you want to filter in the List View Web Part from the list box, and then click Finish. To dynamically change the results in the List View Web Part, in the SharePoint List Filter Web Part, click Filter , click a value, and then click OK. If you selected the Allow Multiple selections property, to redisplay all the values in the List View Web Part, the user must clear all the check boxes, and then click OK. This section discusses the ways that you can filter a List View Web Part, and best practices when you design and edit a Web Part Page that contains connections between filter Web Parts and List View Web Parts. 1. Connect a filter Web Part to a List View Web Part to display a subset of data. 2. The filter Web Part provides a value. 3. The filter value is passed to a column in the List View Web Part by using a Web Part connection. 4. The List View Web Part displays only those columns that match the filter value. Text filter A text value that can be any string, including letters, characters, and numbers. Date filter A date value of month, day, and year. A user can also enter the exact date by clicking a date picker button. Choice filter A predefined list of values and optional descriptions, such as product or status codes. Current user The current user name, or other information based on the current user's profile, such as user name, department, or birthday. This Web Part is a context Web Part, which means that it is not visible to a user of the Web Part Page and the results appear automatically without user input. SharePoint list A list of unique values and optional descriptions, such as product or status codes, generated from a column in a SharePoint list. This Web Part is similar in behavior to the Choice Filter Web Part, and is useful when you have a list of values that might change over time and you want an easier way to maintain the list without having to change the Web Part properties. In the Add Web Parts dialog box or a Web Part Gallery, you don't see the term, "List View Web Part". Instead, you see SharePoint lists and libraries that you can add to a Web Part Page as a List View Web Part. You can connect a filter Web Part to a List View Web Part only in standard list view, not in datasheet view. You can pass only one value at a time to a List View Web Part. You can configure only one connection at a time between a filter Web Part and a List View Web Part. However, you can add multiple instances of the same List View Web Part to a Web Part Page, and then configure a different connection to each List View Web Part. If you want to configure two or more connections at a time for a Web Part, consider using the Data view Web Part. Find links to more information in the See Also section. Choose your Web Part Page template carefully You can move Web Parts around on a Web Part Page to place them in any order and in any Web Part zone that you want. However, before you create a Web Part Page, think carefully about the template that you choose so that you can lay out the filter and List View Web Parts the way you want. When using a Web browser, you cannot change the template that you selected after you created the Web Part Page. If you have a Web design program such as Microsoft Office SharePoint Designer 2007, you can further change the structure of the Web Part Page. Remove connections to disabled Web Part properties In page edit mode, you can see which filter Web Parts are currently connected and how they are connected by a message that is displayed underneath the filter Web Part. "You must remove the connection between the Web Parts to make changes to disabled properties." Remove unused Web Parts from the Web Part Page If you inadvertently close a Web Part, rather than delete it, the Web Part remains on the page as a hidden Web Part. To find hidden Web Parts, find the Web Part Page in the document library in which it is stored, point to the file name of the Web Part, click the arrow that appears, click Edit Properties, and then click the Open Web Part Page in maintenance view link. For more information about maintaining Web Parts, see Customize Web Parts. Was this article helpful? If so, please let us know at the bottom of this page. If it wasn't helpful, let us know what was confusing or missing. Please include your version of SharePoint, OS, and browser. We'll use your feedback to double-check the facts, add info, and update this article.